1. Chocolate Chip Cookie Dough. B&J knew they were onto something big when they made the world’s first batch of Chocolate Chip Cookie Dough ice cream in 1984. Today the flavor still reigns among their all-time most popular concoctions. And how can it not be? It’s not even one of their more complex or fancier flavors. It’s quite simple. Vanilla ice cream with gobs (and yes, there are actual gobs!) of chocolate chip cookie dough. My daughter LOVES this flavor too! Chocolate Chip Cookie Dough, introduced in 1984. 2. Milk & Cookies. We also love this flavor. It’s probably one of the best sellers for any cookie lover. Vanilla ice cream with a chocolate cookie swirl, chocolate chip & chocolate chocolate chip cookies. Did you get that? Yup, it’s chock full of cookies, and it’s heavenly! Milk & Cookies, introduced in 2012. 3. 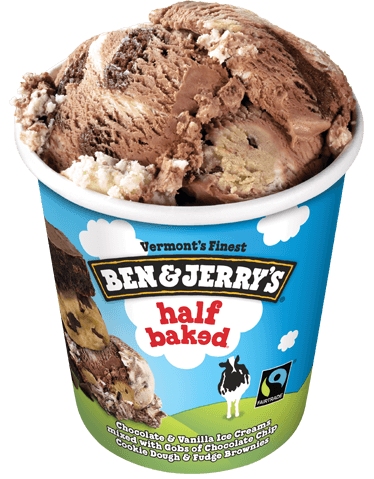 Half Baked. This is another one of our favorites. Chocolate & vanilla ice creams with fudge brownies & gobs (yes again with the gobs) of chocolate chip cookie dough. A little bit of everything, it’s just delicious! Half Baked, introduced in 2000. 4. Strawberry Cheesecake. 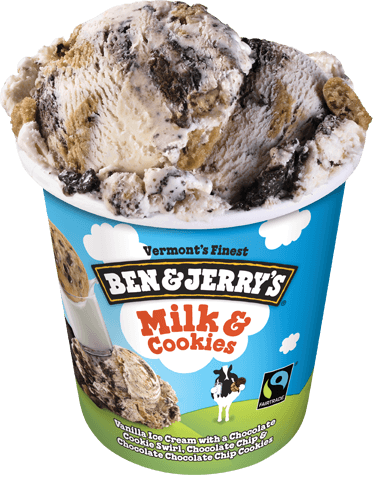 This is one of my all time favorite flavors, however, my daughter doesn’t care much for it (she doesn’t like cheesecake…gasp!). Strawberry cheesecake ice cream with strawberries and a thick graham cracker swirl. 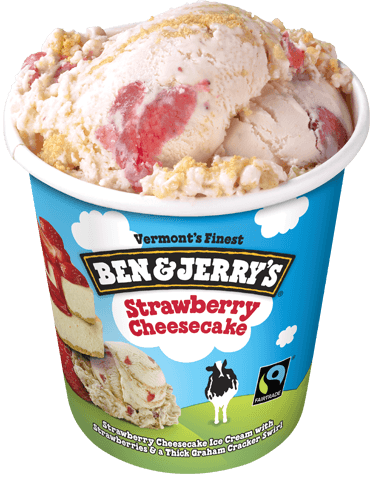 Any cheesecake lover (like myself) will be thrilled with this flavor, and the graham cracker swirl, is just awesome. Strawberry Cheesecake, introduced in 2005. 5. Spectacular Speculoos Cookie Core. Ah…the cores! 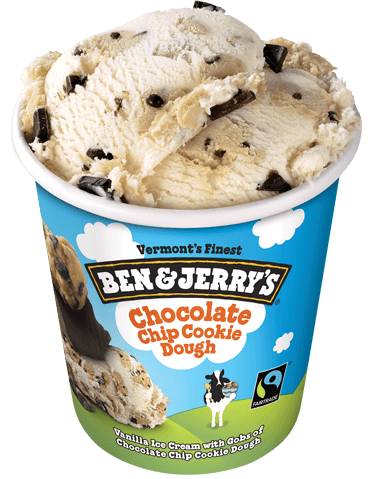 These are some amazingly delicious flavors that B&J came out with some years ago, which each have a yummy, chocolately, caramel or cookie core in the center of the pint. Dark caramel & vanilla ice creams with speculoos cookies and a speculoos cookie butter core. Just absolutely amazing! 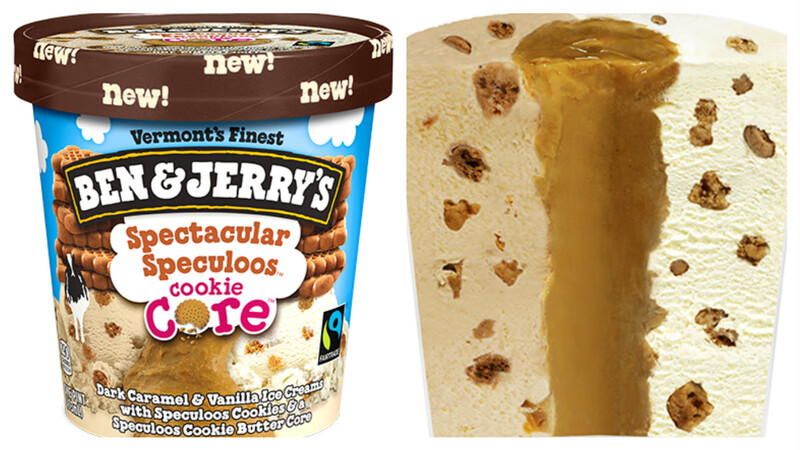 Spectacular Speculoos Cookie Core, introduced in 2015. So, do you love Ben & Jerry’s as much as we do? If so, which are your favorite flavors? I’d love to hear!